How Do I Restore Leather Boots? Restoring leather boots is relatively simple. Leather boots are like old friends. When they are cared for and maintained, they remain in perfect shape. If some time has gone by, they might need some restoration work. Over time, the heels on leather boots can get worn down and the leather can get dry and cracked. Fortunately, leather boot restoration is relatively simple, and you will have your old friends back in no time. Lay newspaper over the work surface to keep it protected. Brush boots all over to remove any grit and street dirt. Be sure to brush around all seams as well, because dirt gets lodged there easily. Apply leather cleaner with a dry cloth over the entire boot. Use small, circular motions to clean leather as thoroughly as possible. Apply leather conditioner to the boot when it has been cleaned. Apply with a dry cloth and be sure to be generous with the conditioner, especially if boots are dry and cracked. Massage the conditioner into the cracks and wrinkles in the leather. Leave conditioner on overnight to ensure the leather absorbs all of it. Apply leather polish with a dry cloth. 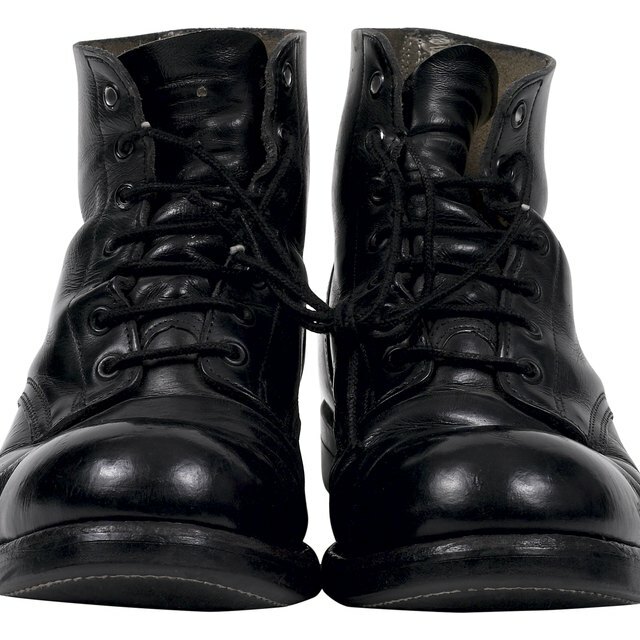 Use small circular motions to ensure the entire boot is covered with polish. Let it dry according to the directions on the product. Buff with a dry cloth when the polish is dry. Brush with soft-bristled brush. Fill the boots with crumpled newspaper to help retain the shape. Store in a clean, dry place. Jane Frances has been writing since 1995. She has written and edited for a variety of national publications.